In his book, The Seven Habits of Highly Effective People, Stephen Covey describes a practical set of habits that can help you grow personally to become more effective. His seven habits represent a principle centered, character based, inside out approach to personal and interpersonal effectiveness. Covey’s approach is to have you focus on developing yourself and your relationships with others. He believes if these habits are integrated into your life, they will help you move through the stages of personal development. Being proactive means controlling your environment, rather than having it control you. Covey believes that highly effective people make decisions to improve their lives through influencing the things around them rather than simply reacting to external force. He believes that it is not what happens to you, but your response to what happens to you that matters. Therefore, when faced with a problem or a difficult situation, this habit has you take the initiative to find solutions rather than just recognizing the problem and waiting for others to solve it. This habit is based on imagination and visualization. It is about visualizing where you want to end up. So before you start something, take the time and plan it out. A little planning will save you a lot of work later and will get you to where you really want to go. To practice this habit begin each day, activity, or endeavor with a clear vision of your desired direction and eventual destination. This habit is about organizing your activities. But it is more than just about managing your time, it is about setting and following your priorities. You have to find out what is important to you and put those first on your list of things to do. The key to putting first things first is to understand that you have many things you can do which will have an impact on your life. This habit has you schedule your priorities. You do this by deciding which activities are most important to you, then determining what steps will best achieve your goals. This habit allows you to prioritize your activities and eliminate those that are not as important. The win-win philosophy sees life as a cooperative arena, not a competitive one. It is based on the principle that there is enough for everyone. This philosophy has you create a frame of mind that has you seek mutual benefit in your interactions with others. It is about getting agreements or solutions that are mutually beneficial. It stresses that your success does not necessarily require another person’s failure. By creating a win-win agreement, you help establish a foundation for an effective, long-term relationship. This habit is about empathetic listening. Most people do not actively listen while they are conversing with another person, rather they wait to talk. Many problems or disputes arise because people are so anxious to get across their point of view that they do not listen to the other party. However, in order to move towards successful interactions with others, you first have to understand what the other person is actually saying. This habit has you focus on really listening to the other person. Good listening skills are essential for developing and maintaining positive relationships in all aspects of your life. This is the habit of creative cooperation. Creative cooperation is based on the theory the whole is greater than the sum of its parts. It is the belief that people working together can produce far better results than they could individually. This habit focuses on teamwork and the open-mindedness. When you genuinely interact with others, and you are open to their opinions, you gain new insight. The key to achieving this habit is to value differences among people and try to build creative solutions through interactions. These interaction help leverage individual differences to find a creative way to solve a problem. Synergy lets you discover things together you are much less likely to discover by yourself. This habit is about personal renewal and growth. Just as a machine will wear out if it is not properly maintained, the same is true for your personal productivity. You need to take time to take care of yourself. 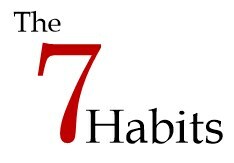 This habit keeps you on the path of continuous improvement. It helps you increase your capacity to produce and handle the challenges you may face in life. Physical – caring for your physical body. It involves building your sense of well-being through exercise, nutrition, and stress management. Mental – sharpening the intellectual abilities. It involves educating yourself on new things to hone and expand the mind through reading, visualizing, planning, and writing. Social/Emotional –developing strong healthy relationships with others. It involves build your own sense of well-being through service, empathy, synergy, and security. Spiritual – your commitment to your value system. It involves building a sense of self through meditation, inner reflection, spiritual reading, and study. By renewing your four dimensions, you can work more quickly and effortlessly on different activities and tasks. More importantly, as you renew yourself in each of the four areas, you create growth and change in your life.